Here's how to choose a good, long lasting greenhouse. Which might be the best buy greenhouse for greener living? Not all greenhouses are the same. 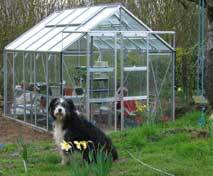 The very best buy greenhouse for green gardening has to be a sustainable one - one which lasts a long time and causes no environmental problems. There's no doubt that a good greenhouse can help you to garden more effectively. It can also be a great help if you want to grow some of your own food. Here in the UK greenhouses are especially great for ensuring that you get some kind of worthwhile tomato crop! Picture: My Rhino greenhouse with our dog on guard! So what's the best buy greenhouse for green living and economy? Read on for an introduction to different types of greenhouse and greenhouse features that you might want to choose. There's also a short section on useful books on greenhouses. There are many good designs but the best tend to be the simple traditional pent-roofed and apex types and geodesic domes. A pent roof is suitable for lean-to greenhouses. An apex roof (like the roof of a standard house) is good for stand alone greenhouses. A geodesic has many sides - typically eight or ten. They look attractive but need to be quite big if you want plenty of head space. It's best to avoid unnecessary complexity and frills (there's just more to go wrong, or be maintained!) The shape you choose should be determined by the site you have selected in your garden and where the greenhouse will sit in relation to the sunshine throughout the day. If you are limited for space a lean-to design along a wall of your house can be effective but your plants will not benefit from full, surrounding light in the way that they would from a free standing model. One advantage of lean-tos is that the heat from a south facing wall will help keep greenhouse temperatures high throughout the evening and night. A greenhouse design which incorporates hanging bars and movable shelving (staging) is worth considering as these can be expensive as accessories. Buy the biggest greenhouse you can afford or have room for. You will almost certainly be able to fully use it and more. However, it is always best to look for a quality product and if that has to mean a bit smaller for the time being, then that is a compromise worth making. You can always add an extension kit later when your budget allows (the link shows one from Amazon). Picture: when it comes to size, big is beautiful... but there are limits! If you opt for a glass greenhouse, buy one with toughened safety glass as standard. Anything else and you are compromising your families safety around the garden and giving yourself an unending source of worry. Safety glass may be a little bit more money but the peace of mind that it brings is worth every penny. A wide door, wide enough to accommodate a wheelbarrow is a good feature. A low sill at the entrance is another worth while feature. Better still is a flush sill, though a slight downside is that you have to be sure to keep the runners free of dirt so that the door will close. You can wheel or carry materials in easily without fear of tripping. This Rion backyard greenhouse from Amazon (Pictured, right) has a flush doorway and double width entrance which would allow room for a wheelbarrow to be brought in quite comfortably. Windows with hydraulic vents are a fantastic invention. If you don't buy agreenhouse equipped with these you will constantly be having to monitor the temperature in the greenhouse. Then you'll need to open and close windowsmanually to adjust the greenhouse's climate. Hydraulic window vents are relatively inexpensive and trouble free. Louvred side vents are another useful addition. Toughened horticultural glass is best. It is relatively heavy and can be difficult to fit but once in it gives excellent service with full admission of light. Have a good look at the window clip system on any glass greenhouse. It is important that the glass is held firmly and securely in place. Some of the better greenhouses use a metal strip to keep the glass in place. Rigid plastics (such as polystyrene - a type of thermoplastic,) gradually become hazy and scratched. They are lighter than glass and are generally safe in use. Many of the cheaper greenhouses use rigid plastic glazing. Expect about 85 to 90% light transmission. Acrylic and polycarbonate sheets are better at retaining heat than glass but they do deteriorate with age. Picture above: here's why you don't want a flimsy plastic greenhouse! Flexible plastic (such as polythene) does not last so well, even though it is UV stabilised. Small plastic greenhouses rarely last more than a few seasons and are prone to blowing over so you need to be careful where you site them. A neighbour of mine is onto her third one (and it was already splitting at the seams at two months old and is now almost useless after another two months). I'm sure landfill sites are filling up with broken plastic greenhouses! 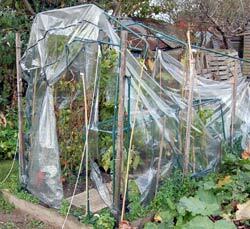 Polythene greenhouses are also prone to condensation problems. If you do opt for one make sure it is sited in a really sheltered spot. Best buy greenhouse: Wood or aluminium? Aluminium is trouble-free and lasts for years with very little maintenance. It tends to be cheaper than wood. Aluminium can be dented or scratched and some corrosion may occur but aluminium greenhouses generally last for years if they are of a good quality to start with. Coloured aluminium greenhouses are popular but slightly more expensive. The powder coating technology used ensures that you will not need to paint yourgreenhouse at all. The finish should last for 20 years or more. Whichever you choose, look for sturdy construction and a good system for fitting (and replacing) windows. Cheap aluminium greenhouse parts may tend to buckle under stress. This self-assembly backyard hobby greenhouse from Rion is rated by users for its strength and relative ease of assembly. Wooden greenhouses look attractive and smell nice to be inside. The only ones worth considering are made from natural cedar or other redwoods as they will last for a relatively long time with minimal maintenance. It's important that a greenhouse has a strong base and the traditional solution was to stand the glass structure upon a low wall of brickwork. This naturally limited the access of light to the area next to the soil. Now modern greenhouses are usually sited directly onto a base of slabs or concrete, or they can be anchored to the ground by concrete ties. There a number of different ways this can be done. The main thing is to check that the greenhouse has a strong anchoring system as the last thing you want is wind damage as your precious greenhouse slips its moorings! A slab or concrete base is fine if you don't intend to grow plants directly in the soil. We opted for a "Rhino" greenhouse which is anchored in the soil by concreted in metal ties. This has proved very stable, despite the site being quite windy. Picture: Self-assembly of a Rhino greenhouse - with a little help! Best buy greenhouse without a door! Here's an interesting greenhouse design I came across. Instead of a door it has roll-up sides. If you are in the US you can buy these direct from the inventor. For everyone else, he publishes his plans so that you can make one yourself. It's called a Veg-a-Lot. The big advantage of this design is that you can use all the space in your greenhouse without treading on the earth, or losing any space to paths. This could be a very green alternative for anyone with a small growing area. The construction is of wood, steel and polyethylene. If you are feeling adventurous it is possible to make agreenhouse from recycled bottles. Here's an article on making a greenhouse as a school recycling project. 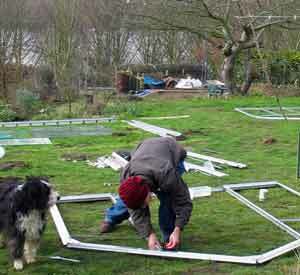 If you are keen enough to build your own greenhouse, How to Build Your Own Greenhouse is a great book. It has details on watering and heating systems, too. Gardening in Your Greenhouse (Greenhouse Basics) is an excellent book for anyone who wants to know how to use their greenhouse well. The author takes a refreshingly humorous approach, too.